There are 11 Assisted Living Facilities in the Loudon area, with 3 in Loudon and 8 nearby. The average cost of assisted living in Loudon is $2,215 per month. This is lower than the national median of $3,346. Cheaper nearby regions include Lenoir City with an average starting cost of $2,200. To help you with your search, browse the 72 reviews below for assisted living facilities in Loudon. On average, consumers rate assisted living in Loudon 4.7 out of 5 stars. Better rated regions include Kingston with an average rating of 4.8 out of 5 stars. Caring.com has helped thousands of families find high-quality senior care. To speak with one of our Family Advisors about assisted living options and costs in Loudon, call (855) 863-8283. Loudon is a quiet historic town located along the Tennessee River about 40 minutes southwest of Knoxville. Home to just over 13,500 seniors, Loudon has three assisted care living facilities within the city limits and eight in nearby communities Lenoir City, Kingston and Knoxville. These facilities are designed for people over 65 who need help with daily living tasks. 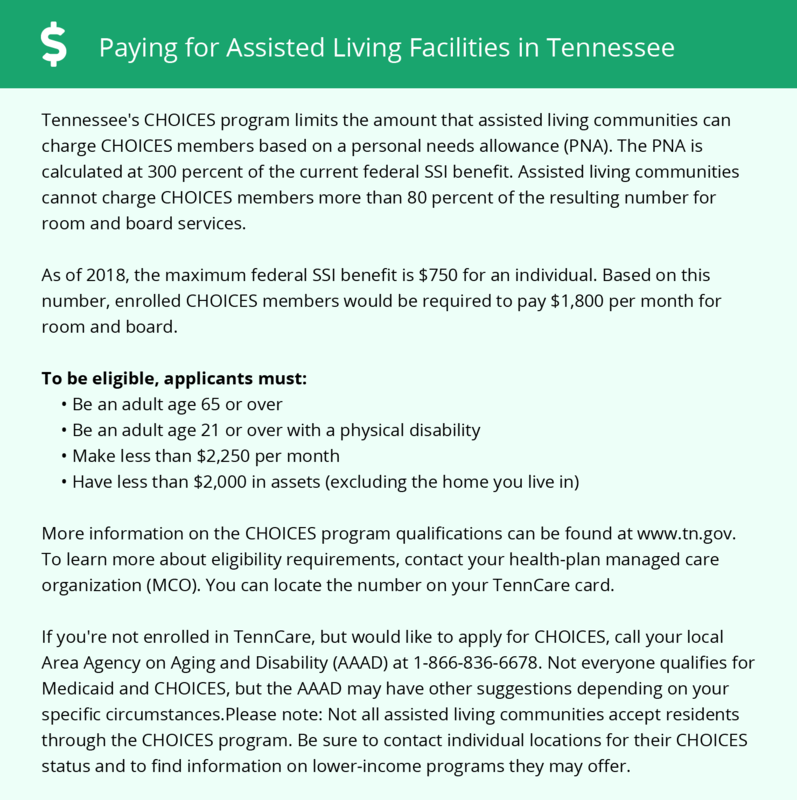 Also known as assisted care living facilities or residential homes for the aged, they provide room and board and services that are regulated by the Tennessee Department of Health. Seniors on a budget who are paying for assisted living may find Loudon more expensive than other comparable cities in the state and across the nation. The cost of living index is 107.1, which is higher than the state average of 96 and the national average of 100. The rate of crime in Loudon is based on a scale from one (low) to 100 (high). Property crime is ranked 29.1, which is lower than the national average of 38.1. Violent crime is ranked 11.4, which is much lower than the national average of 31.1. Seniors who live in Loudon can feel safe when exploring the city or doing errands. Loudon has long, hot summers with average July highs around 89 degrees. The heat may prove to be too much for seniors with respiratory illnesses. Winter lows in January are around 27, and the area only gets around five inches of snow per year. The city of Loudon is home to world-class medical facilities, including the Fort Loudon Medical Center, in the event of medical emergencies or illness. The East Tennessee Human Resources Agency (ETHRA) provides transportation seven days a week for seniors at free or discounted fares. Curb-to-curb services are available, and a 24-hour reservation is required. Loudon has an array of community resources for seniors, including the Area Agency on Aging and Disability, an organization that provides nutrition, employment support and help with utilities, including one senior center. Assisted Living costs in Loudon start around $2,215 per month on average, while the nationwide average cost of assisted living is $4,000 per month, according to the latest figures from Genworth’s Cost of Care Survey. It’s important to note that assisted living rates in Loudon and the surrounding suburbs can vary widely based on factors such as location, the level of care needed, apartment size and the types of amenities offered at each community. Seniors who need help paying for an assisted care living facility may be eligible through two state Medicaid waivers. The Long-Term Services and Supports waiver are for seniors who have lost the ability to perform daily activities like bathing, dressing and taking medications. The CHOICES waiver is for seniors 65 and older with a physical disability. The waivers pay a limited amount for room and board, but family supplementation is permitted. Loudon and the surrounding area are home to numerous government agencies and non-profit organizations offering help for seniors searching for or currently residing in an assisted living community. These organizations can also provide assistance in a number of other eldercare services such as geriatric care management, elder law advice, estate planning, finding home care and health and wellness programs. To see a list of free assisted living resources in Loudon, please visit our Assisted Living in Tennessee page. Loudon-area assisted living communities must adhere to the comprehensive set of state laws and regulations that all assisted living communities in Tennessee are required to follow. Visit our Assisted Living in Tennessee page for more information about these laws.